A highly precise miter saw with a rotating table, for cutting wood or aluminum moldings. The Inmes IM-30 MP comes with all the features included. Right and support arm, pneumatic material clamping system, base cabinet with dust collector, molding stop, quick adjust rotating table. Cutting capacity 3 1/8 inch high by 4 1/8" wide. This saw ships motor freight - please call so we can get a great rate to your locale. 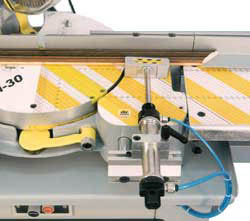 The pneumatic clamping system was especially developed for cutting aluminum and woodprofiles, for best quality and operator safety. The clamping devices are operated automatically by a sensor at the start of the blade descent. Very cool. The IM-30 has a dust outlet with 75 mm diameter, allowing to connect an appropriate dust collector, up to 97% of collecting the dust. The exhaust cabinet was developed to collect the dust during the cutting of the profile -the cabinet doubles as a work table. The exhaust cabinet in addition to being used as a worktable for the IM-30 MP miter saw. The extension arms, and pneumatic clamps also attach to the cabinet. It has a centrifugal exhaust that its possible to switch the cabinet on or off independent of the saw. 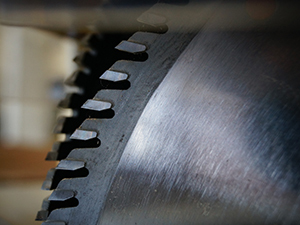 Triple-chip grind (TCG) blades for cutting non-ferrous metals (aluminum) and hard woods. Specially designed carbide and blade geometry for cutting relatively thin-walled aluminum and non-ferrous extrusions and wood frames. The IM-30 MP comes with the right and left extension table. Those extensions have the scale measurement in millimeters, to make easier to find the measure for the profile, besides being a support for the profile during the cut.